A quote fee of $49 will apply to all chlorinators sent in. This will be charged upon initially receiving your chlorinator at our repair centre. If you proceed with the quote or purchase a new chlorinator replacement from us, then this quote fee will be deducted from your final invoice. We require both the power supply and cell in order to accurately assess, diagnose and quote a repair. For electrical safety and legal reasons, please ensure the power supply has its outer cover still attached. 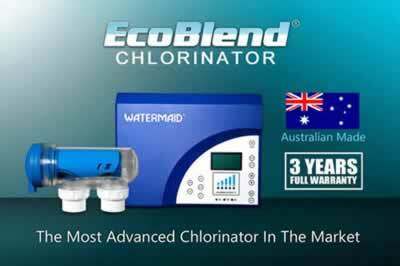 We repair and service all brands of salt water chlorinator including but not limited to: Aquajoy, AIS, Astralpool, Chloromatic, Clearwater, Davey, Hurlcon, Magnachlor, Magnapool, Monarch, PoolPower, Poolrite, Saltigem, Saltmate, Waterco, Watermaid® and Zodiac. Generally, the turn-around time is 24 to 48 hours for common brands where parts are readily available, or slightly longer if part availability is delayed. Our friendly staff will advise you of any expected delays at the time of quoting. If you decide instead to purchase a new Watermaid® chlorinator, we will recommend one of our authorised dealers who can supply and install it for you.